George becomes upset when he learns that his new girlfriend Bonnie, who has a great apartment, has a male roommate named Scott. George tries to persuade Bonnie into getting Scott to move out, and when she agrees he realizes that he is now the most important man in her life. George soon discovers that all the things he liked about Bonnie’s apartment, including the velvet couch and the television, belonged to Scott which makes George regret what he had done. Desperate to get out of the relationship, George asks her if she is interested in ménage à trois, hoping that she will be disgusted and dump him. Instead, he learns that both she and Scott are interested. Bonnie: Well, here we are. This is the place. Bonnie: Do you like it? George: A fan? I would drape myself in velvet if it were socially acceptable. And look at this, hardwood floors! Bonnie: Aren’t they great? Oh, Scott, hi. This is George. George, this is Scott, my roommate. Bonnie: Here, check out this view. If you lean out this window, you can see the river. George: So Scott’s your roommate, huh? Bonnie: Yes. Oh, I’m sure I’ve mentioned him. George: No, you didn’t mention it. Bonnie: He’s a great guy, you’ll really like him. George: I’m sure I will. George: What a movie. Good choice. Bonnie: Thank Scott. He recommended it. George: Oh, Scott, Scott. He’s really great, isn’t he? George: Yes he is. Let me ask you something. When you come out of the shower and you put your robe on, do you cinch it real tight, are you concerned about that? George: Do you hold the neck together with one hand, or are you just letting it flap in the breeze? Bonnie: George, you’re being ridiculous. George: What’s the massage situation? Bonnie: What do you mean? George: Is there any work being done? Is there any rubbing, touching, finger manipulation on the other person, and if so, who’s making the request? Bonnie: George, would you just stop? George: Say you go to the bathroom at two o’clock in the morning, what’s the outfit? I mean, you dressing up or is it come as you are? Bonnie: George, what is wrong with you? George: I’ll tell you what’s wrong, a grown woman with a male roommate! It’s unnatural, it’s an abomination! George: What, what happened? Where’s, where’s all the stuff? Bonnie: It’s gone. It was all his. Is this a label maker? George: The table, the stereo, the VCR, the velvet couch, where’s the velvet? Bonnie: They were his. Besides, we don’t need any of those things. We have each other. George: Here’s the TV. I know you wanted to watch the Super Bowl. Do you at least have some towels we could sit on? It’s, like, a four hour game. Bonnie: George, Scott’s gonna drop by. He said he never got his boxes. I’ll get the towels. George: How am I gonna get out of this? Think Costanza, think! George: Hey, do you know, Bonnie, I just had a pretty wild idea. 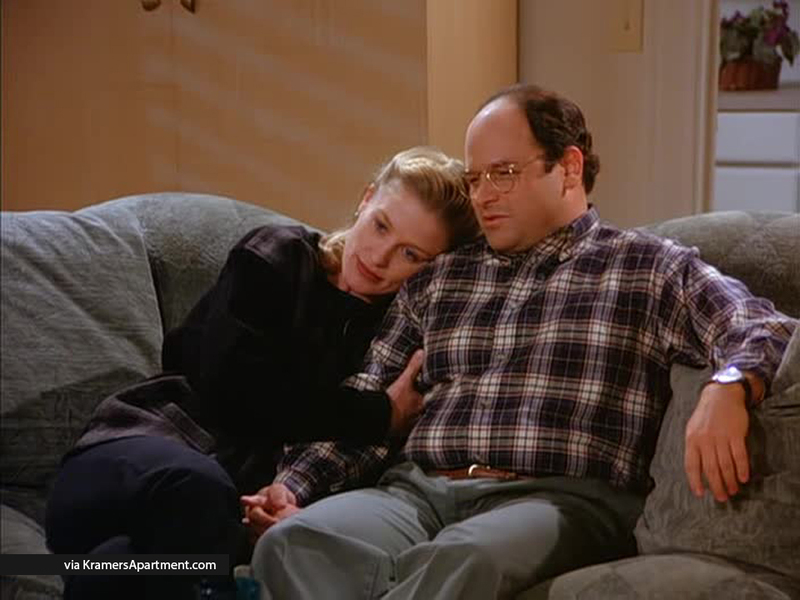 George: Well I, uh, I’m not sure how you pronounce it or anything, but I, uh, I believe it’s Ménage à Trois? Bonnie: Scott! Remember what we talked about the other day? George is into it.